Our team awaits you for a relaxing stopover in apartments with 100% Breton accents! An ideal starting point in front of the Glénan archipelago. 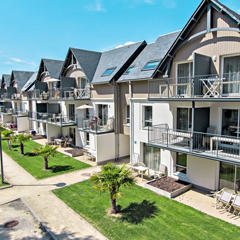 Only 50m from the magnificent Trez beach and 500m from the town centre of the little seaside resort of Bénodet, this three-star residence is a favourite destination for enjoying all the pleasures of the seaside. There is sailing, minicruises on the Odet estuary, crossing to the islands of Ouessant or Sein, coarse fishing or just the spending time on the beach! Feel happier on terra firma? South Finistere is full of delightful towns and villages such as the fortified pirate city of Concarneau or delightful Quimper with its shopping streets. Semi-covered heated swimming-pool TECHNICAL CLOSING INFORMATION NOTE The swimming pool will be closed from Monday, January 21 to Thursday, January 24, 2019. All the modern comfort of the facilities combined with a charming wood and slate decoration make this residence the ideal starting point to discover the South of Brittany. TECHNICAL CLOSING INFORMATION NOTE The swimming pool will be closed from Monday, January 21 to Thursday, January 24, 2019. Every modern convenience and facilities combined with delightful decoration of driftwood and slate revisited that is typically Breton make this residence the ideal starting point for discovering the south of Brittany. 134 apartments with balcony or terrace, with simple interior decoration in pastel tones, driftwood touches, divided between six two-and three-storey buildings with lifts. The apartments are for between two and eight people. Apartments for people with reduced mobility available on garden level. Bathroom with bathtub and separate shower. Type of bed: 1 bedroom with 1 double bed, shower and washbasin and 1 bedroom with 2 single beds and 1 cabin with 2 bunk beds. Capacity: 1 to 4 person. Capacity: 1 to 6 person. Type of bed: one bedroom with 1 double bed, shower and washbasin , 2 bedrooms with 2 beds. For your seaside holidays, the Relais Thalasso Thermes Marins de Bénodet welcomes you in front of the beach of Trez, 150m from the residence. Its hydromarin area includes a seawater swimming pool heated to 32°, Azur swimming pool, sauna, hammam, walking river... Our partner, Relais Thalasso Bénodet offers you all the exceptional treatments of authentic thalassotherapy, those that offer you the best marine benefits. Upon arrival in the cloakroom, each person will receive a bathrobe and towels every day. For a better comfort, we advise the curists to bring 2 jerseys and sandals. Water fountain available. The client will have free access to the hydromarin area during his half day of treatment as well as during the free half day. Want to reconnect with your well-being? or need a break? The marine freedom getaway is a booster of energy to get back in shape. Its Healings will bring you remineralizing and relaxing benefits, essential to your metabolism. 1 modelage under marine rain, 1 bath with sea crystals, 1 remineralizing seaweed wrap, 2 massage baths with remineralizing seaweed, 2 relaxing seaweed wrap, 1 hydromassage bed, 1 manual modelage. Privilege Offer from December 1st to February 17th and from April 14th to May 5th, 2018: 382€*. With 3 daily treatments, this "lightened" cure will suit those who wish to discover the thalasso and enjoy free time to visit the region, enjoy outdoor activities. 3 remineralizing seaweed wraps, 3 remineralizing seaweed bubbling baths, 2 marine rain models, 1 tonic modelling jet, 1 manual modeling, 5 soft or tonic aquagyms. Privilege Offer from December 1st to February 17th and from April 14th to May 5th, 2018:499€*. This is the reference cure! A comprehensive health prevention program based on remineralization, detoxification and gentle physical activity. 2 manual modelling, 2 models in marine rain, 1 hydromassage bed, 4 remineralizing seaweed wraps, 2 remineralizing seaweed massage baths, 2 remineralizing seaweed whirlpool baths, 2 toning jets, 5 soft or tonic aquagyms. Discover and visit Bénodet and its lovely bay! At the southern tip of Brittany, with its own personnality yet unpretentious, Bénodet is in an excellent position, facing the Glénan islands, at the point where the loveliest river in France, the Odet, meets the open sea. The village is of manageable size and the facilities are first class vous inviting you to enjoy the exceptional diversity of the activities: beach, sailing, cycling, golf or the thalasso beauty treatments. Its charms combine the gentle landscapes of the estuary with the bracing ocean, giving Bénodet its ownspecific, agreeable and mild climate, so greatly appreciated by those who discover it. The Club’s Kiosk will tell you all about excursions, walks and unmissable events in the district. We are in a position to inform you about the excursions in Finistère: the lagoon of Letty, the islands of Les Glénan, Ouessant, Sein, Molène, Batz, Quimper, Concarneau, Pont-Aven, Locronan, the pointe du Raz, Océanopolis in Brest, the ocean discovery park, unique in Europe. Discover Névez, land of cottages and standing stones! Along the paths, houses with thatched roofs, dolmens and mehnirs are revealed. Unavoidable! A small fishing port that has become a holiday resort, Bénodet boasts a very rich maritime heritage: visit the Pyramid Lighthouse, which overlooks the entire bay of Concarneau, the Coq lighthouse, named after the rock near which it is located, and the Fort du Coq built under Napoleon III. On the hiking side, nice walks lead you from Anse de Penfoul to the White Sea via the beach ledge. The famous GR34 also passes through Bénodet, follows the cove and the port to reach Sainte Marine via the Cornouaille bridge. The sea air, it opens the appetite! From the Breton pancake to pancakes with salted butter and cider, and the seafood platter... Discover the secrets of making Breton specialities at the Biscuiterie de Bénodet, or visit the family cannery La Compagnie Bretonne du Poisson. A small fishing port that has become a holiday resort, Bénodet boasts a very rich maritime heritage: the Pyramid Lighthouse with a view extending to the bay of Concarneau, the Coq lighthouse named after the rock near which it is located and the Fort du Coq built under Napoleon III. Océanopolis in Brest, the oceans discovery park, unique in Europe. Discover the secrets of making Breton specialities at the Biscuiterie de Bénodet or visit the family cannery La Compagnie Bretonne du Poisson. The beaches: The Trez beach has bathing with a lifeguard in summer, children’s clubs*, sailboard, pedalo and kayak rentals. You can also visit the Le Coq beach, the Saint-Gilles cape and the Letty. Water sports: Trips* on a tourist boat to the Glénan islands or down the Odet, coarse fishing, learning* to sail in the Bay of de Bénodet or among the legendary Glénan islands. In the evening: Casino, cinema and Breton creperies. Stop over at Arcachon at our holiday residence, La Villa Régina. Paris–Rennes autoroute. Join the N24 in the direction of Vannes - Lorient, then the N165 in the direction of Quimper D70 Concarneau Fouesnant - Bénodet. When arriving in Bénodet on the D44, at the Croissant roundabout, take the third exit, continue along the rue de Cornouaille to the roundabout, take the second exit and continue along the avenue de la Mer. 7 days a week from 8.00 a.m. to midday and from 4.00 p.m. to 9.00 p.m. (Except on saturday : from 8.00 am to midday and from 3.00 p.m. to 9.00 p.m.
Arrivals: between 4.00 p.m. and 7.00 p.m. Departures: between 7.00 a.m. and 10.00 a.m.
Pets allowed: € 56 per week, as long as this was stated at the time of booking, acceptance of rules of hygiene and veterinary arrangements (bring an up-to-date vaccination card). Pets are not allowed in the common parts and beside the pool. Animals must be kept on a lead throughout the property. Dangerous animals are not accepted (categories 1, 2 and NAC). Our staff is aware of the need to welcome customers with disabilities. WEEKLY RENTAL PACKAGE: Accommodation, TV, bed and bathroom linen, sauna, hammam. Options: Breakfast: 9€ - Cleaning at the end of stay: 49€ to 77€ - Covered parking: 7€/night - Animals admitted: 8€/night - Comfort formula: beds made on arrival, cleaning at the end of stay, change of towels on request: the night: 12€/studio, 18€/2 rooms and more. -30% off = rent only. From May 05 to 18, 2019. Limited stocks ! Orhoitza is a splendid family holiday residence, with a typical Basque country atmosphere ... Architecture, colours, interior design... up to its name Orhoitza, which means " Memory ".